Cake, ice cream, presents, and a chorus of “Happy Birthday to You” has been a longstanding tradition for many to mark the passage of time in a person’s life. Although trivial to those who sing the song within their household, this eight note song has been the source of millions of dollars of revenue for the companies who have collected royalties from the song over the past eighty years. In 2013 Jennifer Nelson, an independent filmmaker, intended to use the song in her documentary. She filed a putative class action against Warner/Chappell, who have claimed to hold the rights to the song since 1988. During the last two years, artists have been watching this case with great anticipation. Rights to the song could range from $1,500 to $5,000 or more for the use in films. On September 22, 2015 Judge George H. King of the Central District Court of California in Los Angeles issued a 43-page decision stating that Warner/Chappell did not properly own the rights to the lyrics of “Happy Birthday to You.” The decision heavily discussed the history regarding the origin of the song. Both sides conceded that the tune is public domain, but argued over whether the rights to the lyrics had been properly conveyed to Summy Co. A heavily debated fact was whether the Hill sisters had written the lyrics to “Happy Birthday to You”. 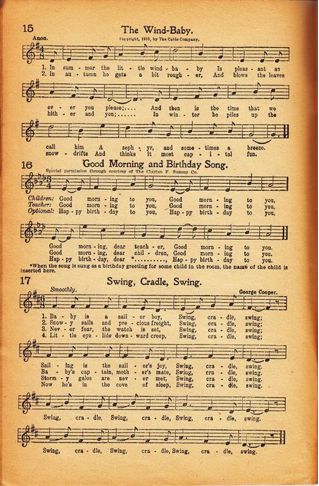 However, Judge King ruled that Summy Co. properly had the rights to the lyrics of “Good Morning to You,” but Summy Co. did not have the rights to the lyrics to “Happy Birthday to You” even if the Hill sisters had written the lyrics. Many believe that this decision places the entire song in the public domain. However, Robert Brauneis, a George Washington University law professor warns that this decision does not explicitly place the song in public domain. Although no one conveyed Summy Co. the rights to the song, they may have conveyed the rights to another company. However, there are no current claims raised, which appears to leave the song within public domain if the decision stands. Warner/Chappell has stated that they are exploring their options regarding this case, so a further challenge may be coming, but no appeal has been filed. In addition, attorneys for the plaintiff have stated that they will be moving forward with a class action to recover the royalties paid by artists since 1988.